Welcome to our Beach House Kitchen! The first night my husband and I spent at our new beach house was on an air mattress. I couldn't sleep. I felt like running around the circle at 155 Ocean Plantation yelling "I did this! I did this!". Y'all I had this house plan drafted, engineered, financed and built remotely from Georgia. I am so excited about the result. I hope you like it as much as I do! 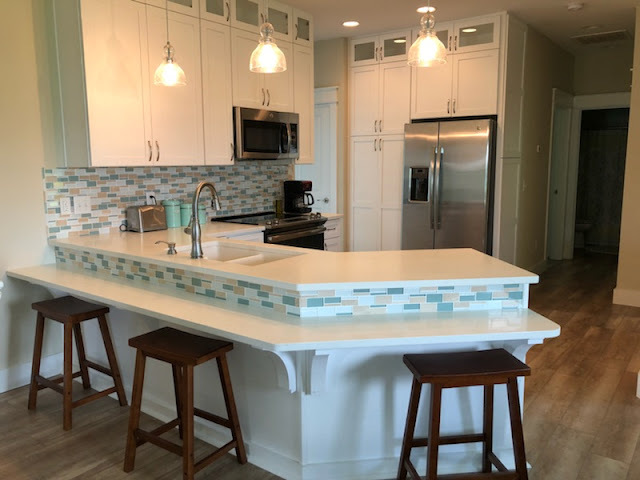 Here are some of my take-aways from our beach house kitchen. I highly recommend "box" cabinets. I had no idea box cabinets were a thing! They are actually pre-built cabinets like you buy unfinished at Lowe's or Home Depot. They are configured for your space just like custom cabinets and finished to your liking. They look fabulous! I estimate they are 25%-40% less expensive than custom cabinets but just as classy with soft close doors and drawers. I worked with a designer to customize the look I wanted although I had to arm wrestle her a little to get her to install my vision. 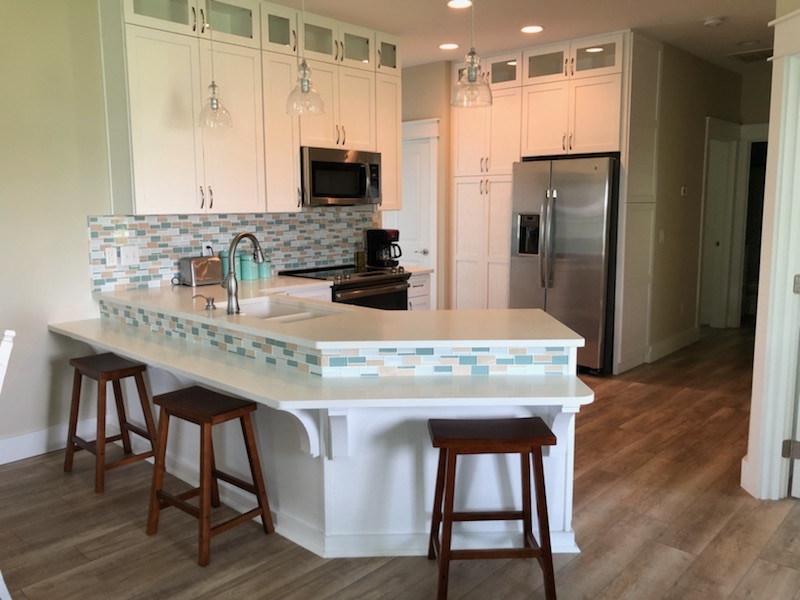 The customization includes the glass doors, cabinets to ceiling height (9 feet), plus built-in decorative panels for the refrigerator and dishwasher. The distressed look of the cabinets aren't visible in my photos. 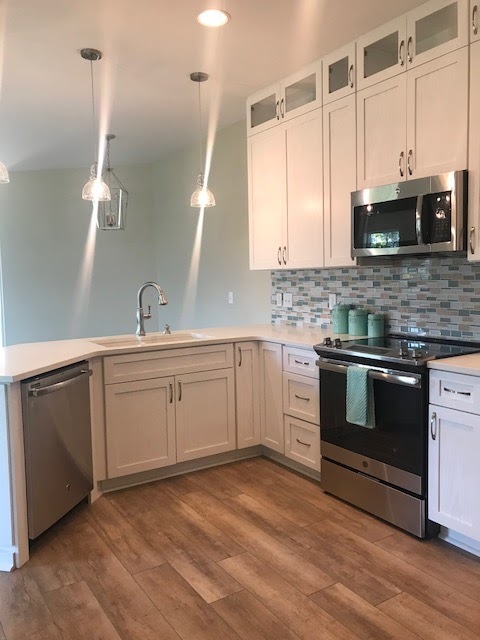 I love the white quartz counter tops! The drop-down bar area I designed for my grandkids is a home run. I ordered the stools from Amazon for $19 each. Score! I have an "insinkerator" aka waste disposal in the sink in our beach house kitchen that I adore. I want one for my kitchen in Georgia. The appliances are GE. The faucet is Delta. The kitchen area is small but so lovely. The dining room table and chairs are from the Trisha Yearwood Home Collection by Klaussner Furniture. Notice the angled left wall that made this dining area a difficult space to decorate. 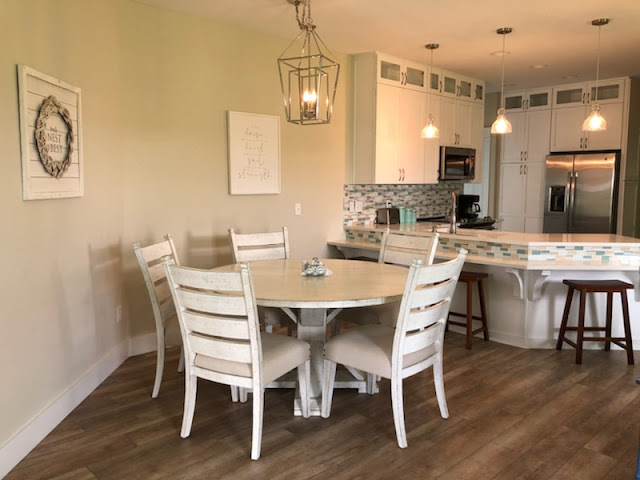 I tried two other tables and chairs, one from Ashley and one from Pier One, before Steve picked this favorite at a furniture store in Panama City. They couldn't deliver it until the end of July so I ordered it online form Nebraska Furniture Mart where it was in-stock in Dallas, TX. This beauty arrived in two weeks. The wall art is from Hobby Lobby. The lighting is from a Panama City store called Lighting by Lavonne. I stressed so much over paint colors that I will do another blog detailing them. If you see anything you'd like more information on in our beach house kitchen, just leave me a comment. I'll be happy to share any of my experiences building a beach house including how to stay on budget, permitting and why you need ceiling fans in Florida! Oh and you can also hover over any of the pictures and pin them to Pinterest. Love your kitchen and island. Didn't know it would not publish my name. It's me....Janice Durocher!! Thanks Sharon! I'm planning a blog on the colors. They are so peaceful! I wish I had them in my house here. We pray for many years to enjoy the home also. Love this space AND your heart, Tammy!